A hole in one trophy is something only a select few have the fortune of having up on their mantle. I’m still amazed that I fall in that category. My hole in one came about 10 years ago at my buddy Bill’s bachelor party. It was on the second hole at Orchard Hills Golf Course in Chesterland, Ohio and I remember thinking it will be a miracle if we’re in any condition to even finish the round. I pulled out a 9 iron with about 130 yards to the front edge. When I hit the ball I thought I crushed it over the green and I remember trying to track the ball in the cloudy sky. Suddenly I heard a clank sound and figured I hit the top of the pin. My buddies though instantly started saying that they didn’t see the ball and thought it went right in the hole. I immediately started running for the green. When I got there the ball was nowhere to be found and I started thinking the unthinkable. Yes, a hole in one. I just got a hole in one! I started yelling like a mental patient and took the ball out of the cup and put it in my golf bag. Orchard Hills would later give me a lame trophy with a plate stating my miraculous achievement. I think that trophy sits buried in my parent’s basement. 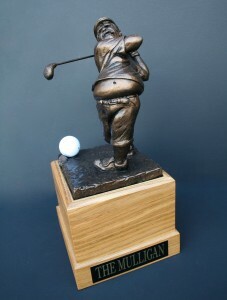 When I sculpted The Mulligan Trophy I had my hole in one ball in mind. It deserved better. Finally it’s time for the ball to rest on a fitting monument to my once in a lifetime accomplishment. Doesn’t your ball deserve the same respect?